Forget Sunday Funday, when the sun lingers a bit longer in the sky, and the weather envelops us in its warm embrace—we want every day to be a day of celebration. 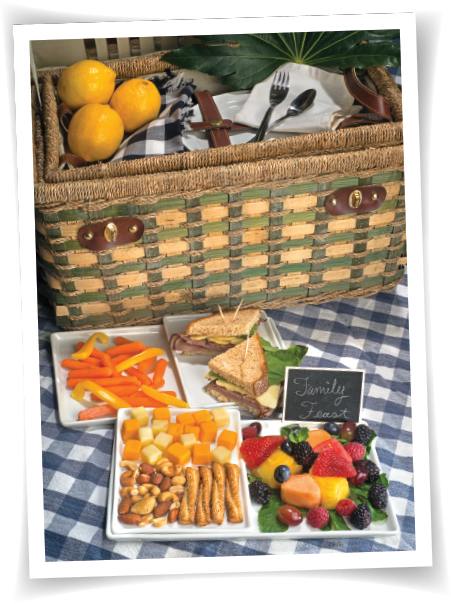 We take advantage of summer and sate our foodie cravings all at once with a picnic. 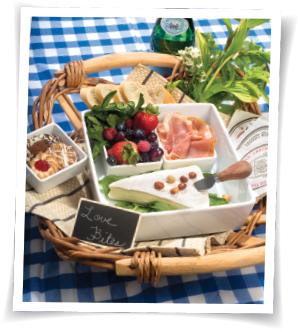 Picnics can be as simple or as elaborate as you’d like them to be. You can grab some gourmet goodies at local shops or restaurants and hit the road, or you can craft your own culinary creations before packing them up for a little supper on the lawn. We’ve got some ideas for hosting a picnic—whether with that special someone or a group of special someones—now that summer has come a-calling in Lynchburg. Dining al fresco can add some excitement to family night. Pack a basket and head to a park, or just spread a blanket in your own backyard and enjoy each other as the day turns into night. in food processor. Pulse until you reach the desired consistency—a shorter time means chunkier peanut butter, a longer time means smoother; adjust oil just a little bit at a time if needed. Add a dash of salt near the end if you wish. 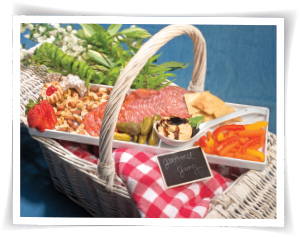 • Don’t forget everything you will need for the picnic: plates, bowls, cups, flatware, napkins, wet wipes and a garbage bag to tidy up after your meal. Scope out your location ahead to time to see if you might need a blanket, chairs or a small table. • Keep hot food hot and cool food cool; don’t take a chance with food-borne illnesses and invest in a cooler for each to keep your dishes at the proper temperature until you are ready to eat. • Be aware of alcohol laws; most public places don’t allow beer, wine or other spirits. Before bringing something to imbibe, check out the rules beforehand. Also, some places don’t allow your fur family, and if they do, they need to be leashed. Nothing says lovin’ like something from the oven; take your love and have a little bite under a canopy of fireflies and drink in life—for it is good. Homemade Soda: Bring a fruity simple syrup (like you add to coffee) to add a shot to your glass before pouring in the sparkling water, stir, and voila!—a homemade soda. Get a group together and enjoy each other’s company—and each other’s cooking. You are the host, so bring the most, but ask friends to supplement the supper by bringing an appealing appetizer. Farmers Market Skewers: Take bamboo skewers, found in the Asian section of most grocery stores, and thread on bite-size pieces of fresh veggies found that week at area farmers markets. Supplement with chunks of gourmet cheese and rolled up gourmet deli meat slices.